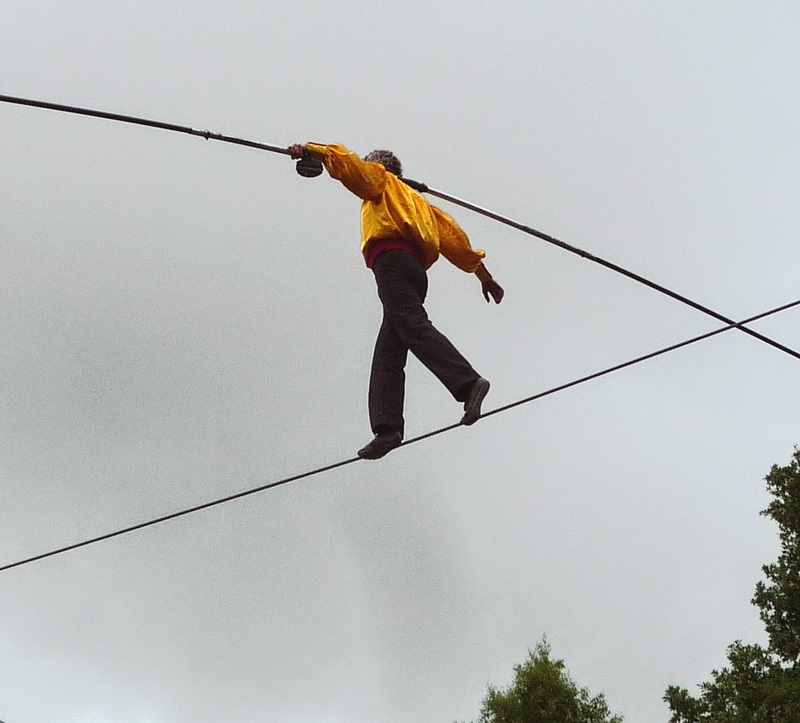 If you are in Paris this Sunday, April 6, do yourself a favor and hightail it over to the 12e arrondissement to the Quai de la Rapée to see acclaimed tightrope-walker Denis Josselin cross the Seine 100 feet up in the air. "Between the Seine and the Sky" is how he describes it. In what promises to be a spellbinding and entertaining event, M. Josselin will make the traversée at exactly 3:30 p.m, going from Port de la Rapée to the Port d'Austerlitz, near the Pont Charles de Gaulle. You'll want to get there early. And definitely not late! The 575-foot trek will take about 20-30 minutes -- plenty of time for photo ops and frissons. Tight-rope walking (le funambulisme) has a great tradition in France -- and Denis Josselin has been part of that tradition: the last time the Seine was crossed by a funambulist, 10 years ago, it was M. Josselin himself. Trained in mime, dance and circus arts, he first "stumbled" into the profession of tightrope walking in 1988 and hasn't looked back. There is a whole afternoon of activities on the banks of the Seine this Sunday, all designed to get you to see this incredible highwire performance, and much of it FREE. Bateaux Parisiens and Batobus are offering free 25- minute rides between the Musée d'Orsay and the Jardin des Plantes. First departure from Musée d'Orsay at 1:30 p.m., last departure from Jardin des Plantes at 6 p.m., every 45 minutes. The cabaret boat Mistinguett will stay docked at the quai (Port d'Austerlitz) but will offer free can-can demonstrations, and you can visit the interior for a look-see. Beverages will be offered. Marina de Paris is offering four free boat rides, between Quai de Bercy and Quai d'Austerlitz, leaving Bercy at 2 p.m. and 3 p.m. and returning from Austerlitz at 4:15 and 5:00. Vedettes de Paris has limited space for a free one-hour Seine ride from their dock at Suffren (near the Eiffel Tower) to the Quai d'Austerlitz, leaving at 2 p.m., arriving in time to see the tightrope event, and returning to Suffren at 5 p.m. Includes a selfie contest and free cotton candy. Seine Avenue (which has smaller elegant ChrisCraft-style boats in gleaming mahogany that will make you feel like you are a wealthy yachtsman!) is offering free mini-trips on board. Let's see -- tightrope walking, barbe à papa, can-can, peniches, cruises on the Seine on a Sunday afternoon. How Parisian is that?